At heart, dissent is about integrity, speaking up on issues that matter, regardless of whether or not we think we can actually change anything. Let’s just call a spade a spade. Shortly after I got news of receiving the W. Averell Harriman Award for Constructive Dissent, I went running with our consul general at post. I go running a few times a week around a dusty old field in front of the consulate. I find the hot midday sun in Baja California somewhat more pleasing than adjudicating visas in my cubicle. And when the CG has the time, he likes the opportunity to exercise and mentor entry-level officers. “So, not to take away anything from your achievement,” he starts, as we round the curve near the carcass of a dead dog. Now, some people might have taken offense at that. I just took it on the chin. I’ll take honesty over platitudes any day. I also happen to think he’s right. I was probably one of the few ELOs considered for the award this year. I hear that generally the nomination pool is small. In fact, I hear that sometimes there are no nominees at all. So I have to ask—where is everybody? Surely the dearth of dissent isn’t for lack of things to say. Just look at the Sounding Board. The fact that we as an institution even have Constructive Dissent Awards (thanks to AFSA) speaks volumes about our intellectual ethos. So, why don’t we speak up? It’s no secret that many officers fear using the Dissent Channel. Let’s face it, the consequences to one’s career could be dire. Promotions passed over. Maligned corridor reputation. Brazen resignations that achieved—what exactly? But there are other reasons besides fear. Like complacency. Apathy. Not to mention a culture that in general seems to discourage creative thinking. As a former journalist, I was accustomed to questioning the establishment. I soon found that the State Department is different. Besides, how many dissent papers have ever actually accomplished anything? Did a war get stopped? Did a policy change? Did State change the way it operates because somebody spoke up? Cynics would say a big fat no. It’s a big risk to take, for so little measurable reward. But since I’m new, I didn’t really think about those things. I just wanted to write about what I considered unfair requirements for transmitting citizenship for unwed mothers along our land borders. I thought I would write a dissent cable on it. I had no idea how to go about it, so I approached previous dissent award winners for their advice. I got a lot of responses. One stood out. “I spent many nights staring at my computer screen before I pressed send,” said one officer, remembering the weeks he spent imagining all the ways his career could blow up. “If I were you,” he said, “I probably wouldn’t do it.” And then he added, “But if you do do it, try not to sound like such a bleeding namby-pamby.” Bam. Another one, right on the chin. To me, this was perplexing. As a former journalist, I was accustomed to questioning the establishment. I soon found that the State Department is different. Here, dissenting voices are not received the same way as they would be in, say, the private sector, where out-of-the box thinking is valued because it can lead to innovation and profit. Here, dissenting voices are viewed as suspect, and possibly dangerous. I also realized that the Dissent Channel is really for officers who have no other recourse. Those who have pulled every lever and bent every ear, to no effect. For them, the Dissent Channel is their last card—the bullet train to the mothership. In the end, I didn’t need to use it, because I found a way to dissent from within. There are many ways to dissent. Here is what I did. 1. Choose your battle wisely. If you’re going to speak up, choose your issue carefully. I picked the one that rankled me most at the passport window. The one that felt unfair in my gut. And I knew it wasn’t just me. I heard it at lunchtime when other passport officers would do a post-mortem on their adjudications. That small talk showed me how many officers feel frustrated at how this one particular aspect of immigration law seems to unfairly limit some people’s chances to become Americans. When I mentioned I’d like to speak up somehow, a fellow ELO jumped at the chance to do something and suggested we co-write a cable. And so we did. It was the beginning of everything. After decades of silence on this issue, what are the chances that two cables would come from separate border posts in Mexico and Canada on the same day? Our entire ACS section in Tijuana cheered. One passed me a copy of the book The Dissent Papers (by Hannah Gurman) and carefully read every draft of our cable that we sent her. The other actively supported our efforts to lobby senior management to take this issue seriously. Their support was quiet, but invaluable. Without it, our efforts would likely have been dead in the water. And when it looked at one point like the cable might die in clearance, I had their encouragement to write an op-ed for The Foreign Service Journal. So that is what I did. I wrote a cable with a colleague for inside communication to the department (with clearances) while simultaneously writing a personal opinion piece (no clearances) for a wider public. 3. Seek allies and collaborators. As part of the cable-writing process, we reached out to other border posts in Mission Mexico, to get a sense of their numbers of denials to unwed mothers attempting to transmit citizenship. Not every post responded, but the ones that did supported our position. They also provided breadth and depth in describing the challenges to adjudicating the physical presence requirements of unwed mothers as a regional issue affecting hundreds, if not thousands of women each year. When one considers the length of our land borders with Canada and Mexico, the numbers of unwed U.S. citizen mothers who cannot transmit citizenship due to Section 309(c) of the Immigration and Nationality Act over the past few decades is likely in the tens of thousands. This is a serious issue. It merits attention. In reaching out about our cable, we also got some intel. Apparently, the Bureau of Consular Affairs has been advocating change on this issue for years. In 2014, they sent an action memo to the Bureau of Legal Affairs to find a vehicle for amending Section 309(c)—though it’s unclear if anything has come of it yet. 4. Work within the hierarchy and push for change. Anyone who has gone through a clearance process knows how painful it can be. I personally thought giving birth was easier. Our cable took six months to clear, and had a list of clearances that was probably longer than the cable’s total readership. Reworking every draft that came was an exercise in patience. At the time, in my inexperienced ELO haste, the edits were excruciating, as entire paragraphs we had agonized over got sliced clean away. But I’ve changed my mind about that. Every edit was worth it. When the cable was finally released, it surged out on a wave of momentum, carrying with it the full support of Mission Mexico. As a result, that cable rang out to the department with a clearer, more resounding voice than we could ever have achieved on our own. As one senior officer pointed out to me, we dissent every day—but the difference is whom we dissent to and how far we are willing to go with it. Incidentally, two hours after our cable hit the wires, a northern border post from Canada released a cable on the very same issue—on the very same day. A bizarre but timely coincidence. After decades of silence on this issue, what are the chances that two cables would come from separate border posts in Mexico and Canada on the same day? Our entire ACS section in Tijuana cheered. It felt like we had just hit the establishment with a continent-sized one-two punch. The drafting officer in Toronto later told me that Canada has been pushing for years to change the transmission requirements for unwed moms under INA 309(c). When they heard that Mexico was doing a cable on it, they wanted to be part of the movement. Me, I couldn’t help thinking about chaos theory—how the force of a hurricane can be influenced by a butterfly’s wing. So let’s be real. I would probably have more luck at finding Jimmy Hoffa than I would at inducing Congress to amend an obscure part of the INA. About a year ago, I was again rounding that dirty old field and trying to catch up with the CG. Our cable was written, but it was languishing in that no-man’s land of clearances with no end in sight. “It doesn’t matter if your cable goes nowhere,” he said, looking over the scrub brush to the horizon. I’d been running along, listening to him talk about his career, how hard it is sometimes to get beyond the bureaucracy and feel like anything one does actually has any impact. We ran in silence for a few paces, dodged a bit of scrub. And then he added, “No matter what, be proud of this. It’s important." So I can’t say I stood up to an unjust war or risked my career to expose some glaring injustice inside the State Department. But I stand next to officers who have. I am deeply honored. 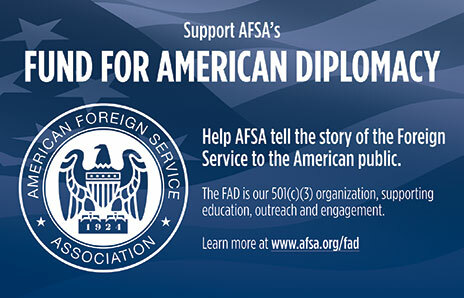 And grateful to AFSA, for helping to create a safe space for dissent. On the face of it, all I did was co-write a cable and submit an article on an issue I felt was unfair. I won an award probably because few other people bother to do this sort of thing. I’m not belittling the achievement. I am proud that I found a constructive way to take a stand on an issue that matters to me. But I can’t help wondering what the department would look like if there were more of us willing to speak up about issues that matter, large and small, regardless of whether or not we think we can actually change anything. Or as one senior officer pointed out to me, we dissent every day—but the difference is whom we dissent to and how far we are willing to go with it. At heart, it’s a question of integrity. Sometimes just adding your voice is enough. 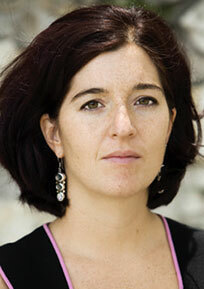 Amelia Shaw joined the Foreign Service (public diplomacy cone) in 2014 after careers in journalism and public health. She is currently doing consular work in Tijuana, her first post. She is the 2015 recipient of the W. Averell Harriman Award for Constructive Dissent.